More than 800 potato scientists, industry representatives, government officials and other interested parties from 50 countries gathered in the Andean city of Cusco, Peru for the 10th World Potato Congress (WPC) and the 28th Congress of the Latin American Potato Association (ALAP), held from May 27 to 31. 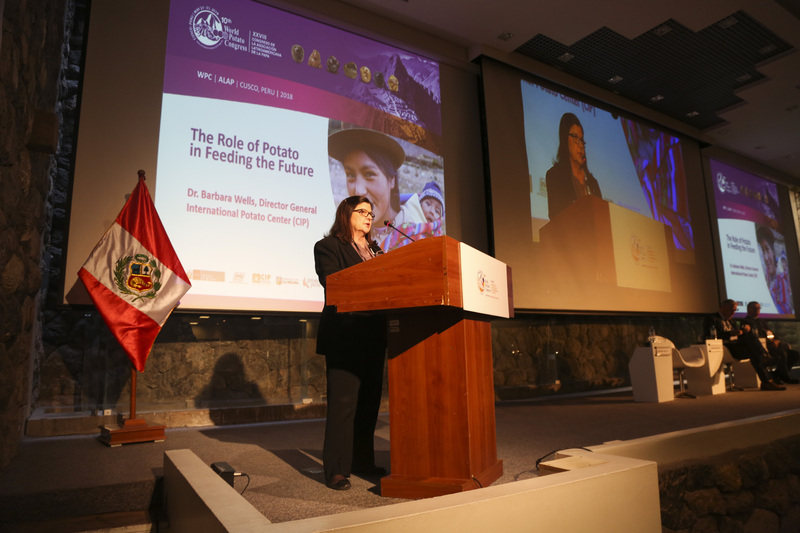 The event, which included ample participation by scientists from the International Potato Center (CIP), raised the potato’s profile in Peru and beyond by highlighting the crop’s rich biodiversity and its potential for reducing hunger, malnutrition and poverty. The WPC is the most important international event for potato science and business, held in a different country every three years. WPC 2018 marked the first time that the Congress took place in Latin America. And because this WPC was held in parallel with the 28th ALAP Congress, it constituted an unprecedented international convergence of potato experts and an opportunity for people from the research, development and business sectors around the world to share knowledge and network. 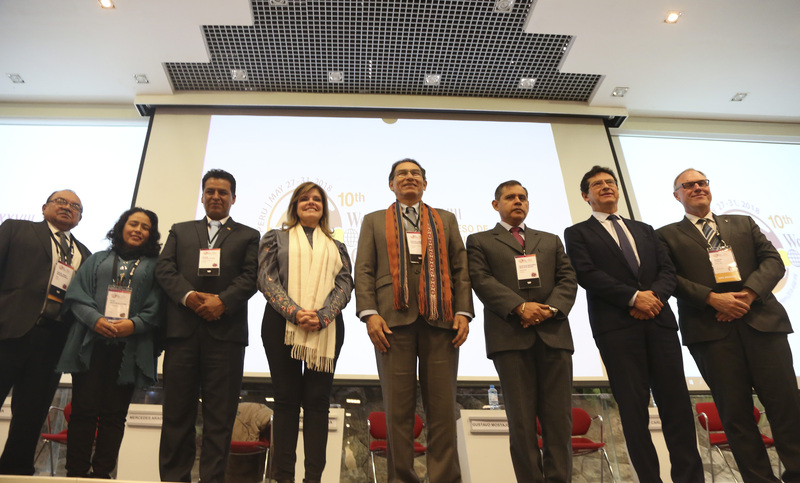 Dr. Miguel Barandiarán, Director of INIA, Elisa Salas, President of ALAP, Edwin Licona, President of Cusco Region, Mercedes Aráoz, First Vice President of Peru, Martín Vizcarra, President of Peru, Gustavo Mostajo, Minister of Agriculture, Carlos Moscoso, Mayor of Cusco and Romain Cools, President of World Potato Congress, Inc. at the inauguration of the 10th World Potato Congress. “More than one billion people eat potatoes, the crop’s potential for strengthening food security, diets and incomes has yet to be fully exploited,” Wells said. In addition to plenary presentations and technical sessions on subjects ranging from climate change’s implications for potato farming to trends in potato consumption, the first day of WPC 2018 included a regional meeting of ministers and other high-level representatives from the Ministries of Agriculture of Peru, Ecuador, Colombia and Bolivia. CIP agricultural economists André Devaux, Miguel Ordinola and Guy Hareau gave a presentation to the ministers about the use of native potato biodiversity to improve food security and smallholder incomes in Peru over the past decade, during which time sales of native potatoes increased by more than 70 percent, and market prices for them, by 150 percent. The meeting resulted in the ministers signing a regional agreement that includes measures to strengthen the conservation and sustainable use of native potato biodiversity across the Andes region. Researchers and business representatives participating in WPC 2018 and the ALAP Congress had the opportunity to participate in technical sessions on an array of innovations that included potato variety development and biotechnology, improved pest and disease management, crop management and the importance of potato biodiversity for breeding and nutrition. They also had opportunities to enjoy the cultural and culinary attractions of Cusco, the former capital of the Incan empire and a major Spanish colonial center, where the abundant restaurants in historic buildings serve native potatoes in an impressive array of recipes. WPC 2018 was organized by INIA, which is part of Peru’s Ministry of Agriculture and Irrigation, in collaboration with CIP, the National Agrarian University La Molina, the Ministry of Foreign Trade and Tourism and the Peru country office of the Food and Agriculutre Organization.